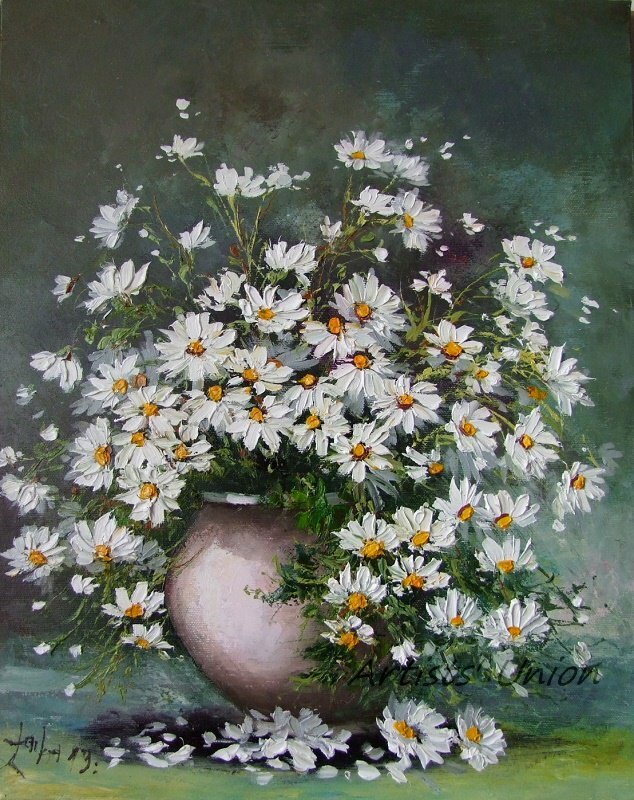 A beautiful wild flowers bouquet - still life with white daisies in a ceramic vase. A very decorative floral fine art with a nice texture of applied oil paints. This is an original, one-of-a-kind, signed, varnished, impasto oil painting on a high quality stretched canvas. professional Artist, the member of The Association of Polish Artists Painters And Designers in Warsaw. Technique: Painted with palette knives and high quality oil paints. The painting is varnished to protect it from dust and pollution. Varnish also intensifies all pigments on the painting surface by the refraction of light and this way has additional beautiful effect on the final appearance of this great oil art. The painting is offered without a decorative frame. Shipping: the same business day after receiving cleared payment. It will be sent as a registered and the first priority mail (Tracking Number Included). +	Helpful Seller/Quick Ship/Great Wrap/Good Emails/Lovely Impasto Painting! "Don't pick flowers, paint them. Cut flowers last a few days, floral paintings can be treasured for generations."